Wrap yourself with memories of one who has passed. When a parent or grandparent has passed, who feels it the most? Kids and grandkids have a special bond. A custom quilt made from their clothing can be a special 'hug' from those who are not here any longer. Don't forget to have one made for YOU. My grand-daughter was having a particularly difficult time last night at dinner. Lots of tears. While I was planning on gifting the grandkids with the wonderful memory quilts you made for Christmas, I had to bring out Ashleys quilt and give it to her now. She wrapped herself in the quilt, gave me a tearful smile, and said - "grandpa is giving me a hug". We were all bawling after that. Thank you so much. We can use almost any piece of clothing. Just keep in mind that if that item of clothing can't be laundered (i.e. silk or paper) then it might not be the best item to include in this quilt. We WANT this quilt to be used, and to be used for years to come. And for this same reason, we recommend that memory quilts be 'throw' sized. These quilts can be used in a chair, on the couch or just wrapped around when a private moment is needed. When you bring your items in, we will go through the clothing and let you know if it can be used successfully or if we should not use it. While the best clothing items for quilting are woven cottons and cotton blends, we can use most any item. [OK, hats are pretty hard to get to lie flat... ] Knit fabrics can be used because we do use a 100% woven cotton stabilizer. It is not that STIFF stuff that many non-professional quilt-makers use. A good stabilizer is necessary to prevent distortion when quilting and makes that quilt last a lifetime through many launderings. We can use sweaters (unless they are really thick) as blocks, because our soft cotton stabilizer allows us to quilt this with no problem. We have a several styles that work really well with lots of random items of clothing. 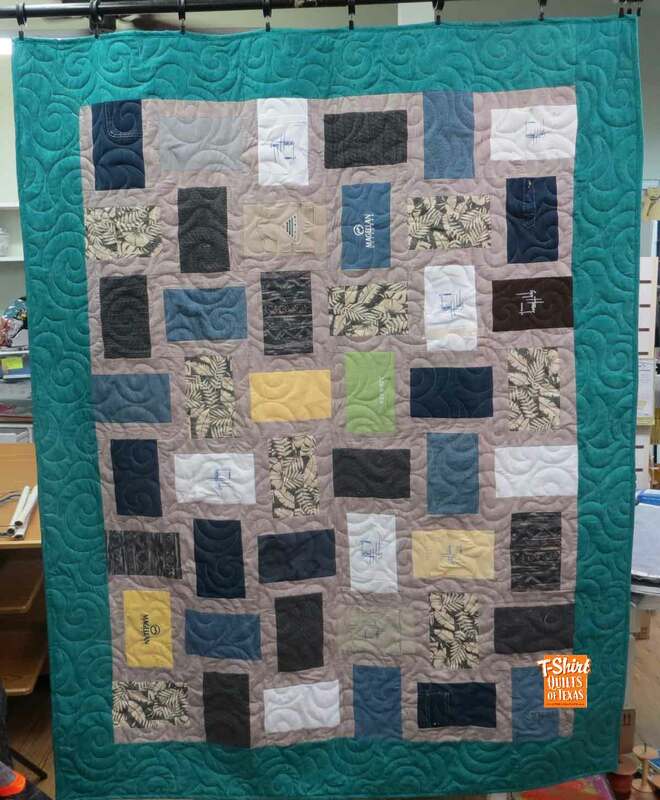 Our most popular style of memory quilt is the 4-square style. 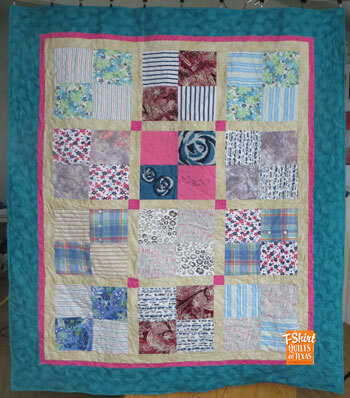 This style of quilt can utilize both t-shirts and clothing. The clothing is pieced into "4-patches" and are the same size as our t-shirt blocks. The example to the left uses about 20 different pieces of clothing. 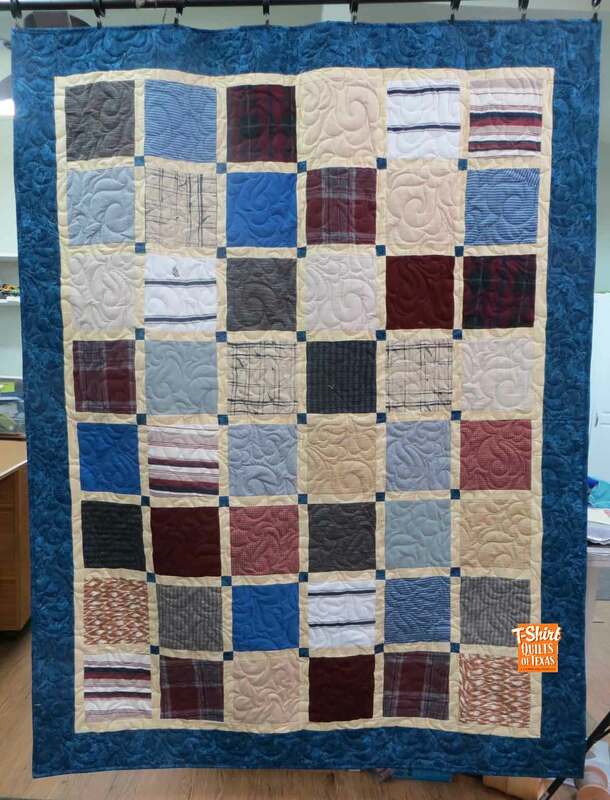 Another popular and economical style of Memory quilt is the modified Fractions Quilt. We cut a consistant size rectangle surrounded by strips that cause a secondary pinwheel pattern. This quilt is a little more modern but still just as comforting for the owner. A Traditional Quilt (left) takes a consistent size square and is surrounded by sashing and cornerstones. Your choice of sashing and border color fabrics. We can use a few or as many as you like items of clothing. You select the fabrics that we design your quilt with from over 700 bolts of in-stock fabrics. If you have a special request, just let us know by contacting us today! Do you have clothing hanging in a closet, or maybe you have packed away? You can't bear to toss them or donate to charity. You want to something that is a tangible remembrance of your loved one.